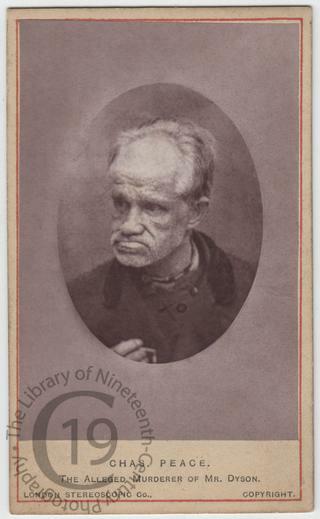 A carte-de-visite portrait of the rubbery-faced Charles Peace, executed on 25 February 1879 for the murder of Arthur Dyson, a civil engineer whose wife he was stalking. Born in Sheffield in 1832, he attained notoriety as a cat burglar in Manchester and Leeds over a period of some 20 years. The first person he murdered was a policeman in Manchester, but an unfortunate innocent was falsely convicted of the crime in his place. When Peace murdered Dyson in 1876, he went on the run, continuing his burglarious activities in London for a further two years. He was finally arrested after shooting another policeman whilst trying to escape arrest. Having given a false name, he was initially only found guilty of attempted murder, but once his true identity had been uncovered he was tried and executed for Dyson’s murder.